Dafney Davis’ class from South Gallia presents a Constitution Day rap to Hannan Trace Elementary students last week. 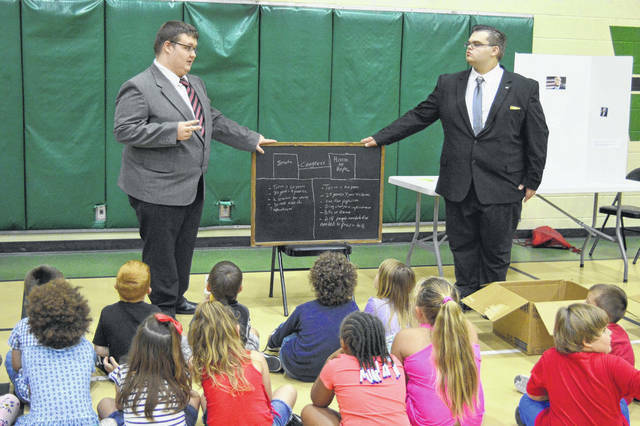 Joseph Hubman, left, and Tyler Hess, right, of Brea McClung’s class from River Valley High School, discuss the importance of the House of Representatives and Senate in the U.S. Congress before Vinton Elementary students. 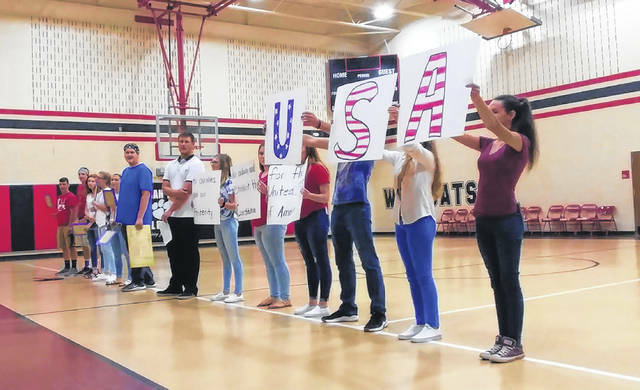 GALLIA COUNTY — Gallia County Local Schools high school students gathered with area elementary schools to teach their younger peers about the importance of the U.S. Constitution and the basic forms of American government. Students from South Gallia’s Dafney Davis’ accelerated government class visited students at nearby Hannan Trace Elementary in Mercerville, Wednesday of last week, and students from River Valley High School’s Brea McClung’s accelerated government class visited students at Addaville, Vinton and Southwestern Elementary Schools the following Thursday. Constitution Day is a federal observance which recognizes the adoption of the US constitution and its citizens. It is typically observed on Sept. 17. South Gallia students led Hannan Trace Elementary students though a rap about the forms of government and Constitution articles while River Valley High School students led various groups of students through individual stations geared towards specific article lessons.